The Pyramids were built for the pharaohs of the Old Kingdom who ruled from 2686 to 2134 BC. The tombs inside the pyramids were huge and had four walls. The first Egyptian pyramid had stepped sides and was built in Saqqara around 2650 B.C.E. The pyramids built over 100 years later, in Giza, had flat sides. Inside the pyramids were burial chambers and secret passageways. No one really knows why the tombs were built in a pyramid shape. One theory is that the sides were viewed as a stairway to heaven to help pharaohs achieve eternal life. The Pyramids still stand today. The manual labor needed to construct them was not provided by slaves but by ordinary workers who provided their unskilled service each year when the flooding Nile made it impossible for them to work in the fields. The three Pyramids of Giza were erected for the Pharaoh Menkaure, the Pharaoh Khufu, and his son Khafra. Khufu’s pyramid is the largest of the three. It is known as, “The Great Pyramid.” There are also three smaller pyramid replicas in front of the three large pyramids, which were built for Menkaure's wives. After the pyramids were built, they were covered in a white limestone casing. When first built, The Great Pyramids was 484 feet tall. Because of the deserts’ harsh winds, it is now 449 feet tall and remains one of the largest monuments that exists today. The second pyramid- the one that belongs to Khafra- is 446 feet tall. The third, which belongs to the Pharaoh Menkaure, is the smallest of the three at only 230 feet tall. Guarding the front of Khafra's pyramid is the Great Sphinx, a large statue with the body of a lion and the head of a human. It was carved from a mound of natural rock. For much of the last 4,500 years, it was covered in sand. For centuries, legends have been told about the Great Sphinx. These tales tell of the powers and mysteries the Great Sphinx holds. Some people believe that secret rooms or passageways are hidden underneath the Great Sphinx, but nothing has been found yet. In between the paws of the Sphinx is a story written on a stele, a stone tablet, placed there by Pharaoh Thutmosis IV who lived around 1400 B.C.E. 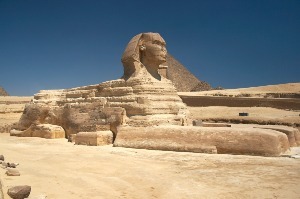 The story tells of a prince who was very tired and fell asleep next to the Great Sphinx after hunting all day. The prince had a dream that the Great Sphinx promised him he would become the ruler of Upper and Lower Egypt if he cleared away the sand covering up its body. That’s all that is left of the story; the rest is a mystery. The Great Sphinx of Giza is an amazing and captivating statue, just like the ancient Pyramids themselves.